After completing her Bachelor of Visual Arts degree (at the Adelaide Centre for the Arts TAFE SA). In 2007, Dare became an access tenant at the internationally-renowned Gray Street Workshop. This workshop provides a supportive studio environment of valuable exchange between emerging, mid-career and established practitioners. Emerging talents and leading practitioners provide valuable peer on peer mentoring. In April 2010, Dare became a partner in the workshop, joining co-founders Catherine Truman and Sue Lorraine in continuing its legacy and shaping its future, including establishing the workshop’s gallery space. In 2012, Dare undertook a residency at SquarePeg Studios in Sydney — a studio. set up following the Gray Street model — and it was during this time that she was able to explore the wonders of the Sydney Royal Botanic Gardens and treasures of the Australian Museum. The greatest trove she discovered was the museum’s collection of Blaschka sea anemones. Leopold Blaschka (1822–95) and his son Rudolf (1857–1929) virtuosity in lamp-worked glass saw them produce botanical specimens of a calibre that has never been reproduced. The marking of time and the fleeting nature of memory are at the heart of the Conceptual flowering plant series. 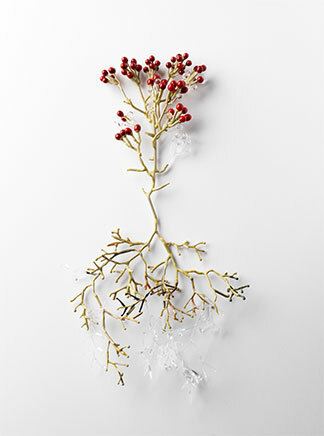 Not aiming to create true replicas of nature, Dare brings together the delicate structural elements of plants, leaves, stems, buds, flowers and shoots, which by their own nature seem fragile and ready to break. Within the works, the rich vibrant colours often lose their saturation, fading to clear — a metaphor for the transience of memory.